Since MeowGirl and I started this blog I have wanted to include a section of historical reference for craft projects. I have been googling and unfortunatley haven't found a lot of online references for Godey's Lady's Magazine or Modern Priscilla. My two magazine obsessions. Over the past 20 years I have worked on collecting as many volumes of both magazine that I could afford. 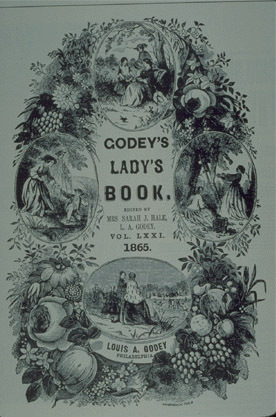 So what is Godey's Lady's Magazine you may be asking. It was the first magazine established exclusively devoted to women in America. Sarah Hale's (first editor) creed was for the improvement of women and from day one she didn't turn from that goal. Why would a crafting blog want to spend so much time researching Godey's Lady's Magazine references? In each issue there was a large section devoted to parlor crafts and fashion. Here click on, The Project Gutenberg eBook of Godey's Lady's Book - January 1851. If you scroll down the page there is a large section on; Knitted Flowers, Chenille Work, The Chemisettes and Undersleeves, corners for pocket handerchiefs, or even a new receipt for a washing mixture. Note: After much though and consideration, I decieded over the next couple of months I will go ahead and post the articles from the Work Department that I have on the site. For other people who are working on making the text available they are obmiting these sections. Unfortunately these are the pages I most want to read, so I will make what I have available. I did a lot of research and it appears that the magazines are all public domain.